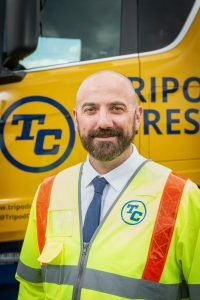 Neil Peacock has joined Tripod Crest as group health, safety and training manager. These areas have always been a top priority, and his arrival brings a whole new dimension with a commitment to continuously review company practices and to ensure that all appropriate innovations are taken on board. In particular, Neil will focus on developing an interactive culture within the workforce with regards to health and safety. He is also working on bespoke training standards for the sector, which are going to be offered across the industry, not just Tripod Crest. Neil will be looking at historical issues and then by analysing data, talking to gangs and also embracing modern technology, the objective is to minimise plant operator interface. Neil has over 18 years’ experience covering management, asphalt production techniques, quarrying and material processes. Holding many industry qualifications and committed to personal and business development, he has delivered training to people from operative to director level in health & safety, bespoke course development and assessment for levels 4 through to 7. Most recently at MPQC MP Skills, Neil has also worked for a number of the sector’s major players – Breedon Aggregates, Lafarge Aggregates and Aggregate Industries.